Are the new ceramic non stick pans any different than the old Teflon® ones? Surprisingly, the ceramic non stick pans are different in many ways. Let’s take a look at the differences. Teflon® and all other PTFE (polytetrafluoroethylene) non stick coatings have an upward heat limitation of 500 degrees Fahrenheit. This is a limitation defined by the FDA, who says that the PTFE will begin to break down at temperatures above that limit. Obviously, it’s not a magic cutoff point, but the issue is that you don’t want to use teflon pans, PTFE cookware or BBQ grill mats anywhere near 500 degrees. 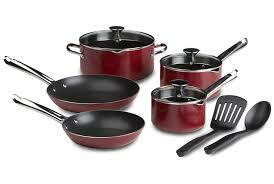 The ceramic non stick pans, on the other hand, will withstand heat a bit above 800 degrees Fahrenheit. This provides a significant advantage in terms of durability and longevity. If you employ the same practices you would with a PTFE coated pan – low and medium heat only, not radical temperature changes, soft spatulas only and no abrasive cleaners – you will get significantly more use out of the ceramic non stick pans than the old style PTFE cookware. Another point about the heat resistance of the ceramic coatings is that the manufacturers claim that even when the pans are overheated they don’t emit toxic fumes like the PTFE coated pans do. Is this true? I couldn’t say for sure but it sure would be great if it is, wouldn’t it? Are the ceramic non stick pans really non stick? My experience is that you need to be a lot more careful about how you use the ceramic coatings in regard to their non stick properties. There are foods that do stick to them such as whitefish and certain marinades and sauces. This is true of Teflon® and PTFE pans too, but I find the ceramic coatings to be a bit trickier. The manufacturers of Greblon and Thermolon, two of the top non stick ceramic brands, claim that the ceramic non stick pans have superior non stick properties over Teflon® and other PTFE coated pans. If there is any difference in the non stick properties between ceramic and PTFE it is a subtle one, otherwise there wouldn’t be any difference of opinion about it. So I think it comes down to what you’re trying to cook more than anything else. In spite of the fact that the ceramic non stick pans are more durable and more resistant to scratching and corrosion than the PTFE coated pans, most people report that the don’t last as long. This is partially due to the thickness of the coatings. 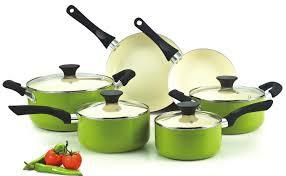 PTFE pans multiple layers of nonstick surfacing while non stick ceramic pans use only a single thin layer. It keeps them affordable, but cuts down on their lifespan. A large part of how long your non stick pans will last has to do with the way you treat them, of course. So whether you buy ceramic non stick pans or PTFE cookware, follow these simple rules to get the maximum lifespan from your pans. 1. Use low and medium heat when cooking. Don’t turn the burner on high because you’re in a hurry to heat up the pan. That’s the main way pans get incinerated. Just don’t do it. 2. Never expose your pans to sudden temperature changes. The most common way this is done is by putting the hot pan under the faucet and running water on it. Very bad. 3. When you wash your pans never use any abrasive pads or cleaners. Just stick to a dish cloth or a sponge. 4. Don’t use metal utensils with the non stick pans. I don’t even use wood, because even though it is softer than the metal, it is hard enough to scratch the non stick surface. I use soft plastic and silicone only. So how do the non stick ceramic pans stack up? It depends on what your priorities are. If you are concerned about environmental impact and food safety, in my opinion the ceramic non stick pans are a better choice than the PTFE cookware. If you’re priority is to buy the pan that will last the longest, the PTFE pans would be your choice. Hope that helps. Reviewing all the options currently available in non stick cookware is a daunting task to say the least. It’s not just that there are so many non stick cookware brands to wade through, though there are for sure. But more than that, it’s the fact that there are so many different opinions about what the phrase “the best non stick cookware” actually means. What makes it the best? There are several camps of thought on that issue. Let’s take a look. Scanning through the forums that deal with the subject of where to find the best non stick pots and pans, the most common thread I found was regarding safe non stick pans. There’s a lot of concern currently about the safety of the tools we use to cook our food. And justifiably so. Is there such a thing as a green non stick pan? For me the answer to that issue is simple, though a lot of people won’t agree with me on this. I believe the safest non stick cookware, and therefore the best non stick cookware, is stainless steel and second to stainless is cast iron. Many of you won’t even agree that those are non stick surfaces at all. And if you’re comparing them to Teflon@ style products and spinoffs from that type of non stick surface, you’d be right. But if you’re truly looking for some healthy non stick pans, those are the only ones that I would confidently say are completely non toxic. And they are actually non stick cookware if you learn how to use them correctly. I’ll do another post on that later. Is there any other safe non stick cookware? Well let’s be pragmatic here. Safety is a relative issue for many and it is often balanced with convenience. For example, it’s statistically safer not to drive a car but we accept the risk for the convenience – and most of us take measures to minimize the risk by driving sensibly. We can apply the same concept to examining the top rated non stick pans. 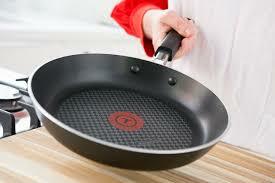 The two main problems with toxicity from non stick surfaces are particulates in the food and off-gassing. You can virtually eliminate both of these issues with proper and careful cooking techniques. Keep your heat low to moderate at all times. Never turn your burners on high, even to warm up the pan, and never expose the pan to sudden temperature changes. I’ve seen people take a Teflon® pot out of the refrigerator and put it on a hot stove. I’ve seem them take a hot pan and run cold water on it. These practices are not good. They wear down the non stick coating on the pan and cause it to break down, which means it’s going to end up in your food. If you’re concerned about toxicity, you should also learn to toss the food in the pan instead of using a spatula. If you do use a spatula use a soft one. Even wood is a bit harsh for a Teflon® style non stick pan or ceramic too, for that matter. Silicone is the least problematic and if you do use a spatula keep the pressure light – the more you scrape on the pan with anything the harder it is on the non stick coatings. All right already, so which is the best non stick cookware? Okay, so if you don’t consider stainless steel or cast iron to be non stick pans, then which brand offers the non stick kitchen set? Well, you’ll have to decide if you want to go with the old style Teflon™ pans, or the ceramic coated cookware, or the new style of copper non stick cookware that has a ceramic style non stick coating on the surface. If price is a consideration for you all of those options are still viable because every style of non stick cookware comes with a wide price range. Generally, the prices reflect the quality of the pan. So just remember you get what you pay for. For example a ten dollar piece of non stick ceramic cookware is not going to hold up as well or perform as well as a fifty dollar one. Like I said earlier, I consider stainless steel to be the best non stick cooking surface, but if I had to choose from the three “truly non stick” surfaces, I’d take the copper. This isn’t a random or arbitrary choice. Copper is absolutely the best metal for quick heat absorption and uniform heat distribution. 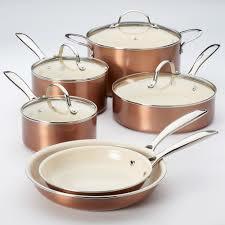 The copper is coated with a ceramic like non stick surface that isn’t as slick as PTFE non stick surfaces (i.e. Teflon®) but is more convenient to use and clean than a stainless steel pan with no coating. According to the manufacturers, the non stick surfacing on the copper non stick pot set is tougher than PTFE and more scratch resistant. It also withstands the heat better. This doesn’t mean you can cook on high heat or use metal utensils them. It means if you exercise the same caution as you would on teflon cookware that your non teflon pans will last a lot longer and be safer to use. It’s worth adding that I’m not alone in my position on this. 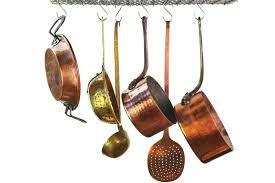 Currently the copper non stick pots and pans are the top rated non stick pans across the board. So they get my vote for the best non stick cookware if you don’t want to deal with uncoated stainless steel. If you’re in the market for a non stick frying pan there are more options today than ever before. To quickly simplify the process of selecting a new non stick frying pan, let’s figure out what your priorities are. The three main considerations are price, safety and convenience. Any non stick cookware reviews need to cover all three of those issues in order to be useful in the decision making process. These are considerations that affect people’s perception about which are the best non stick pots and pans. So it definitely applies to choosing the best non stick frying pan. So let’s address them one at a time. Are you most concerned with price? 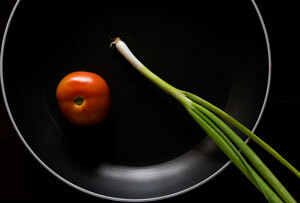 The best non stick frying pan prices are going to be the cheapest to produce, which in today’s world will be Teflon@ or any other PTFE based non stick surfacing. If you’re buying a non stick frying pan online you will definitely find the lowest prices, by far, in pans with the Teflon surfaces. If you don’t have safety concerns about these pans, they will be a good fit for you because they are also very convenient to use. 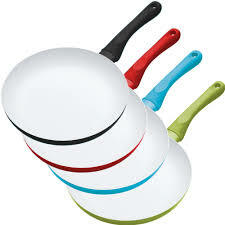 As long as you are aware of the rules of non stick cookware safety you can get a lot of use from the PTFE coated pans. Never overheat them and never use metal utensils or anything that can scratch the surface. When you see signs of scratching, get rid of the pan, unless you don’t mind a bit of polytetrafluoroethylene in your food. Is safety your top priority? 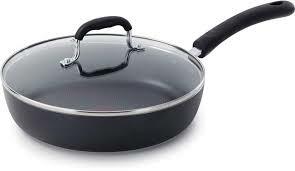 Safe non stick pans would be those that don’t off-gas when in use, and that have the most stable non stick surfacing – so it isn’t released into the food while cooking. In many ways, the idea of “healthy non stick pans” is a bit of an oxymoron – a phrase that contradicts itself. 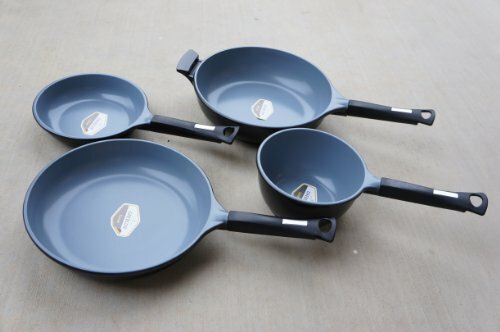 If you truly looking for the safest frying pans to buy, you will probably want to stick with (non pun intended) a more traditional surface such as stainless steel or cast iron. These are, in my opinion, the safest non stick cookware, though a lot of people wouldn’t even consider them to be non stick at all. The trick is in learning to use them correctly and that simply takes practice. There’s no question that these are the safest frying pans. On the other hand, if you’re looking for a healthy non stick cookware that employs a true non stick coating (unlike stainless or iron) you’ll want to avoid all types of Teflon® cookware. 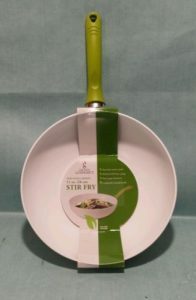 There is no truly green non stick pan you can buy, but the ceramic and ceramic-style non stick surfaces are more durable and will withstand more heat than the PTFE coated pans. If you don’t overheat them and you only use non stick utensils (wood, plastic or silicone), the surfacing will not come off in your food. Are you considering convenience above all else? There are a lot of ways to define convenience. 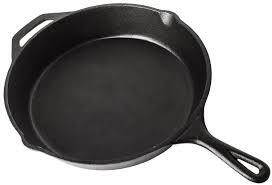 If convenience were my top priority, I would be looking for a non stick frying pan with a lid – also a large non stick pan. When it comes to the non stick pan coating, both the PTFE coatings (also used to make bbq grill mats) and the ceramic non stick frying pan coatings a similar. If you consider how quickly the pan will wear out, then you’ll want to ego with the ceramic as it is more durable and less susceptible to heat than the PTFE. 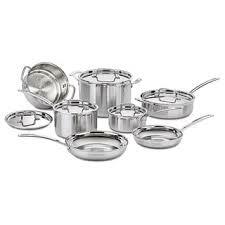 The top rated pots and pans are the ones that are constructed to provide quick and even heat distribution. 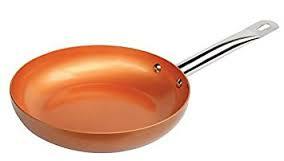 Copper is the beat material for that purpose and the best non stick cookware brands either make the pan base from copper or use a copper plate on the bottom of the pan. An example of this is the old Revere Ware. Another trick that is used is to sandwich aluminum between stainless steel plates so you get the best of both worlds – quick and even heating of the pan with the stability and safety of the stainless steel. But again, if your viewing it strictly from the point of convenience, the best frying pan will be the copper pan with a ceramic-type non stick pan coating. These are the easiest to use – and though the Teflon is easier to clean, it doesn’t last as long and scratches more easily. But you can weigh that one out for yourself. You can read more about these various options below this post – I’ve included examples of the various styles of non stick frying pan with reviews, ratings, prices and descriptions. I hope you’ve found this useful. 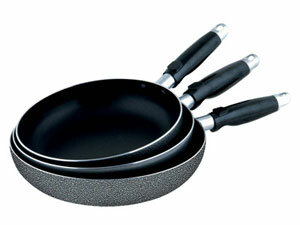 There are a lot of ways to assess the quality of kitchen cookware, like a non stick pan, for example. The great thing about the internet is that we have access to thousands of reviews from customers and this provides a quick way to makes a decision using the process of elimination. Currently the best non stick pan, which is getting the highest ratings, by far, is the copper pan – there are a number of valid reasons for its popularity. Recently there have been health concerns about the fluorocarbon non stick pan coatings such as Teflon® – the controversy centers around the release of gasses when the pans are overheated and the gradual wear on the pan that results in particles of the non stick coating ending up in your food. These pans have proven to be a great convenience in the kitchen over the years but they are no longer the best non stick pan to be using. 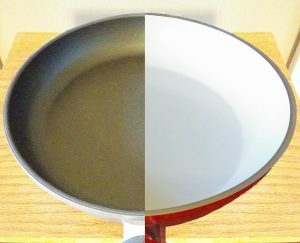 It’s important to point out that these problems with traditional non stick pan coatings can be largely mitigated by not over-heating the pans and by only using soft utensils, such as silicone, when using the pans. But back to copper. Copper is the best metal for quick even heating with a lot of control over temperature. Many chefs use copper for this reason. In applications where exact temperatures and accurate temperature changes are required, copper has no equal in the world of non stick pans. 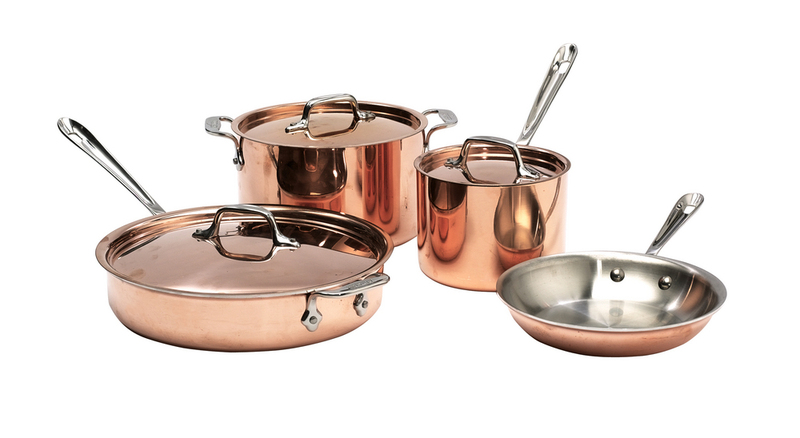 Copper has long been the best non stick pan for many specialty applications but there have been important limitations. For example, the FDA has issued warnings about copper cooking pans adding possibly dangerous amounts of copper to the food. 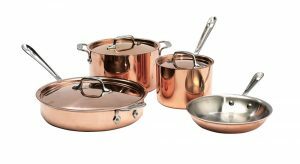 Consequently, a copper non stick pan is going to be surfaced with tin, ceramic, or ceramic-type surfacing, or stainless steel. 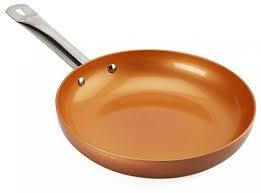 If your copper non stick pan is coated with tin, it will discolor over time, turning a light grey color. Don’t try to clean this off, as it will destroy the tin surface. Tin can be sensitive to scratching and heat both so it is not an improvement in that way over the fluorocarbon coatings. Stainless steel over copper is the most durable and poses the least risk of any pan to introducing toxic substances into the food. However, stainless steel is not a non stick surface, though it is easier to clean than other cooking surfaces because it is so durable. The new alternative to copper cookware coated with tin or stainless steel, is a ceramic or ceramic-type coating that withstands high heat and is scratch resistant. This seems to give the best of both worlds, with the non stick characteristics of Teflon and the durability and longevity of stainless steel. In today’s world this appears to be the best non stick pan available. A non stick pan with the ceramic-type coating will come under different proprietary names such as “Cerami-tech,” “Thermolon,” and “Greblon.” These are all different formulations of the same concept. These are applied using a a process referred to as Sol-Gel, which converts the inorganic liquid to a gel which can then be bonded to any metal surface. Sol-gel is sprayed or the item is dipped into the mineral gel which is then cured and hardened using a high-heat process known as curing. This does provide a much more stable cooking surface than the PTFE coatings do. The same rules still apply to using a copper non stick pan. If you want it to last and if you want to maximize safety, you’ll still follow the same rules that are accepted for any non stick pan. When you wash a copper non stick pan only use detergent and a dish cloth. No abrasives allowed – no scouring pads either. Always use low to medium heat. Don’t change the temperature of the pan abruptly. For example, never take it off the hot stove and run water on it. Even though your label says “dishwasher safe,” always wash the pan by hand. Use plastic, wood or silicone tools. Metal utensils can chip or scratch the ceramic surface.